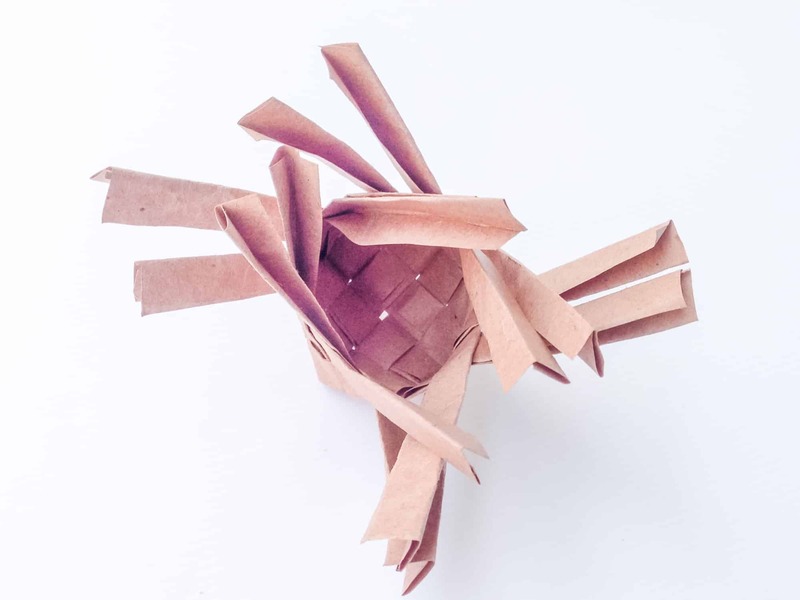 This paper weaving basket is a really fun Easter crafts for kids project that is perfect for older kids to do. 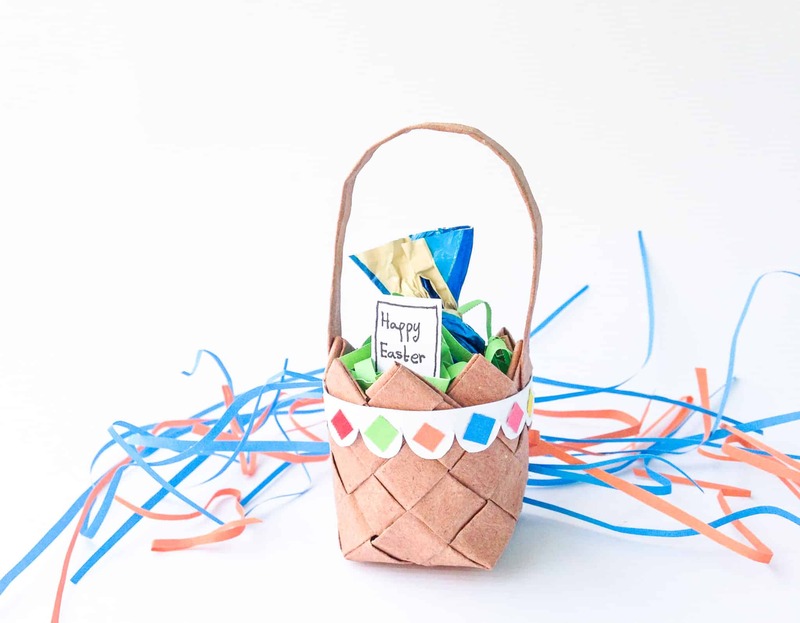 Grab the free printable paper weaving pattern to create this fun Easter basket. 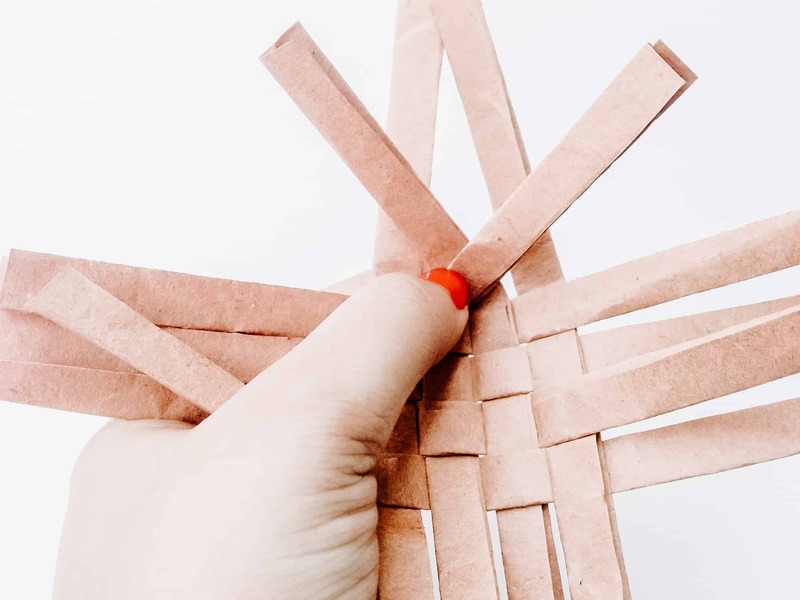 Paper weaving is a fun craft project that is inexpensive and easy. 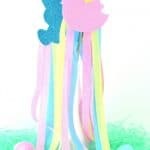 Follow these detailed instructions and photos to weave your own paper Easter basket and fill it with treats! 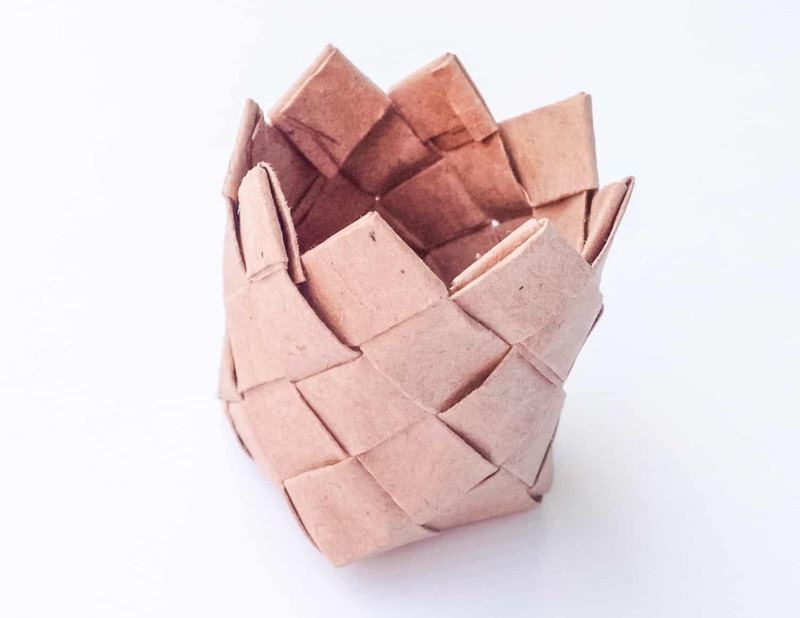 You could make these paper baskets for any occasion, not just Easter. Use them for May Day, Mother’s Day or as a teacher gift idea. 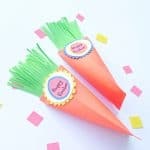 If you like this paper weaving craft then you’ll also love this Easter carrot paper craft. 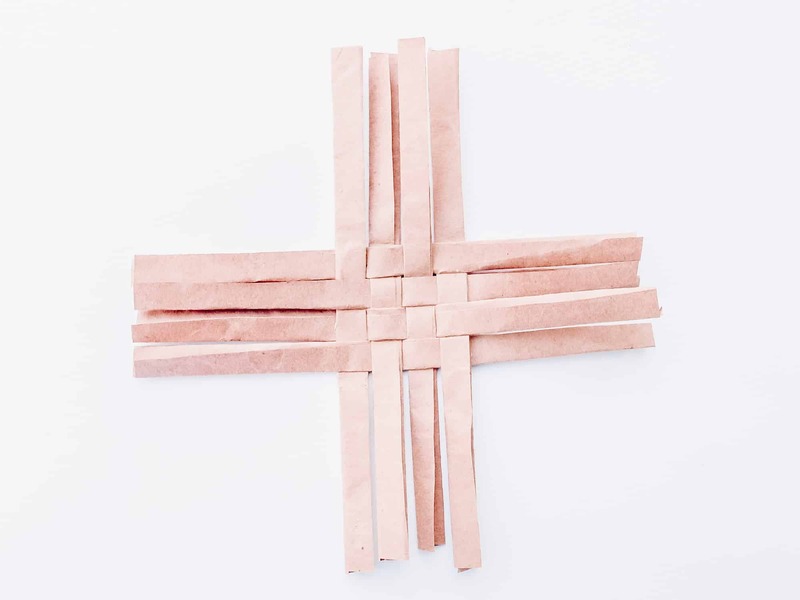 First, grab the free paper weaving pattern for the Easter basket craft. 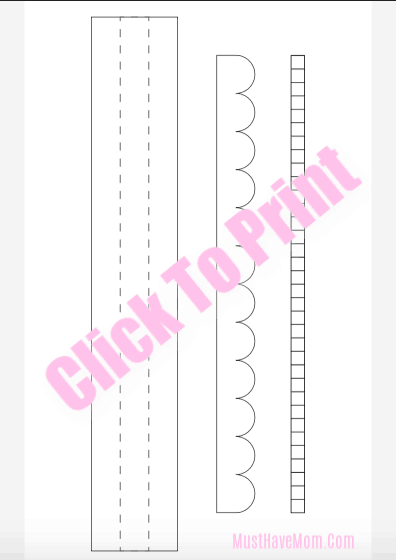 Just enter your email and I’ll send you the pattern to download and print. 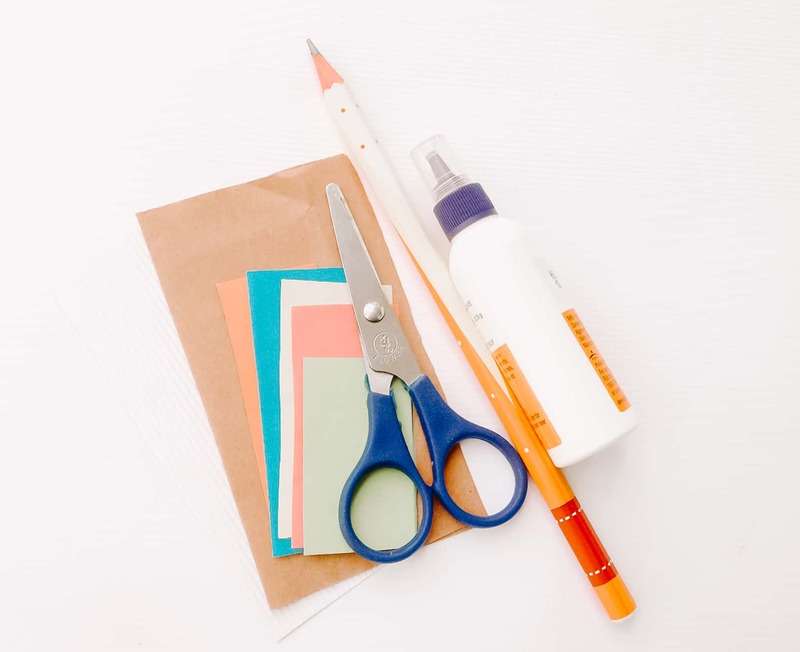 Cut brown paper bag into strips of 3 cm wide and as long as it can be. 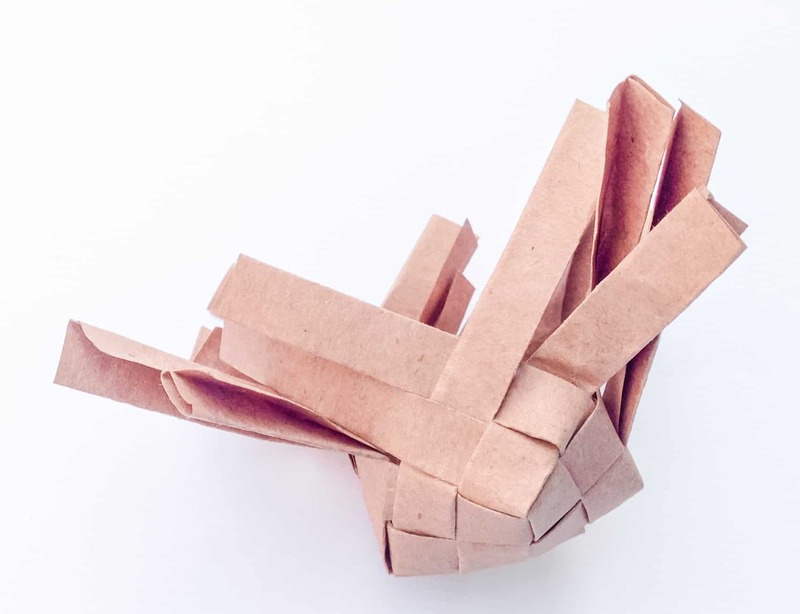 To create mini basket you can use the template pattern. Fold the width of the strips 3 times, thus creating 1 cm wide strips. You’ll need an even number of strips to make this basket, we’ll be using 8 strips for this project. Lay out 4 strips vertically and weave the 5th strip horizontally, over and under the 4 strips. Take the rest of the strips (3 more) and weave over and under the first four strips. If a strip is woven over a strip the strip on the next line should be woven under that strip. 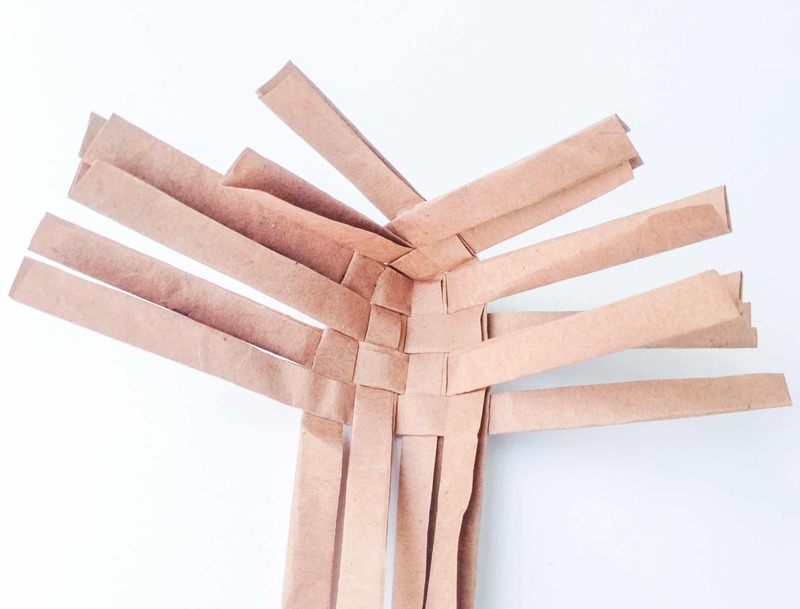 Tighten the weave carefully and glue the overlapping strips on each corner to secure the weave. Notice strip 1 and 2 in this step. Fold up strip over strip 2. This weave will form a corner. Now continue weaving over and under with the strips on both sides of the strip 1 and 2. This is how it looks like after weaving the 4 strips of any one side. Repeat the process for the 3 other sides of the woven pattern to form all 4 corners of the basket. The basket should now look something like this after weaving all 4 corners. Now continue upwards by simply weaving over and under. Find out the weave with the shortest height. 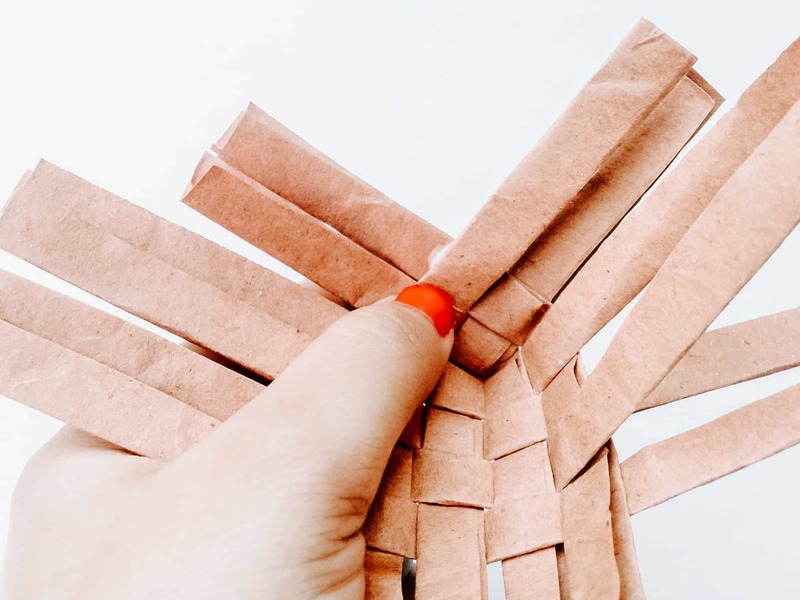 Fold the strip inside if there’s any amount remaining after weaving or simply glue the strips together to secure the weaving. Here’s an inside view of the closed weave. This is how the closed weave looks like from the outer side. Bring all the closed end of the weaving to the same height and glue them to secure the weaving. Trace and cut out the scallop border pattern from the template. 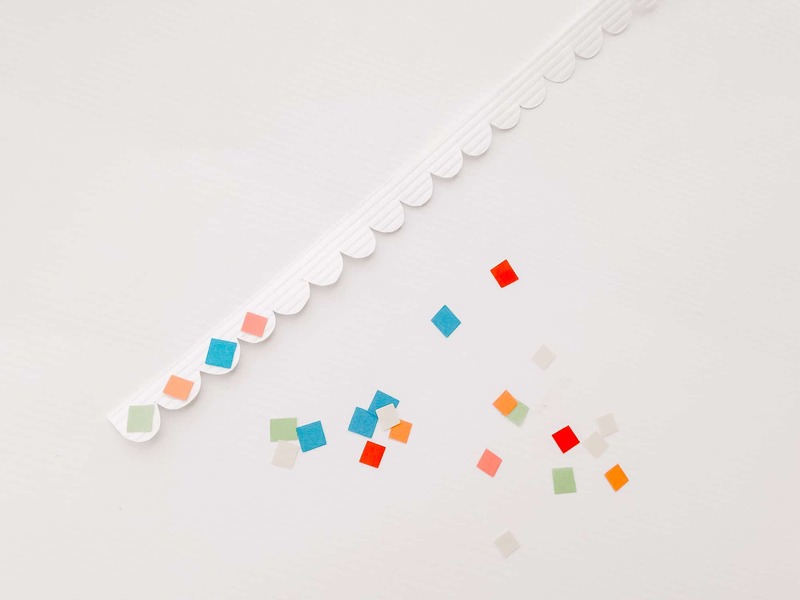 Select 4-5 colored craft papers and cut out small square pieces from them. Glue the small square patterns on the scallop border. Glue the scallop border around the basket. 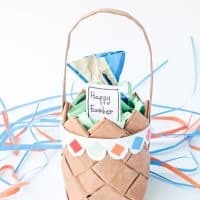 Cut some thin strips of colored craft papers and put them inside the basket and then place the candy or chocolate inside it. Done! 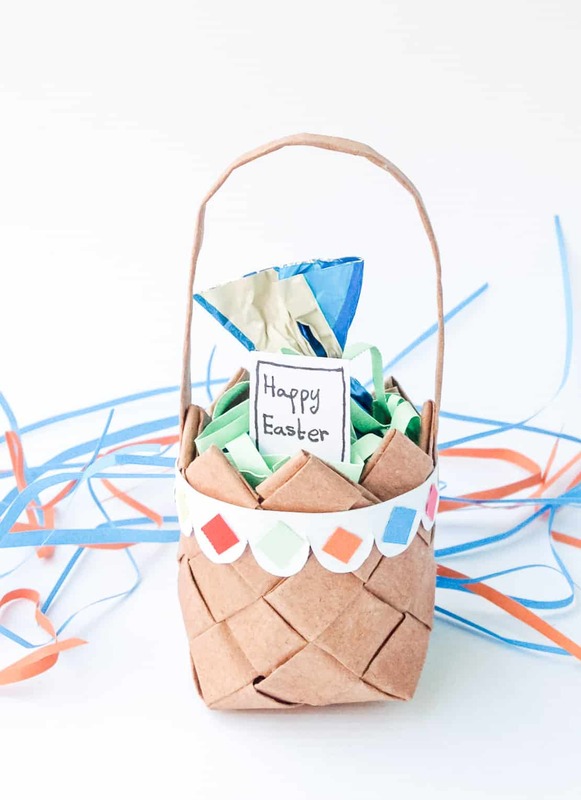 With just a little time and some paper bags, you now have an adorable Easter Treat Basket. 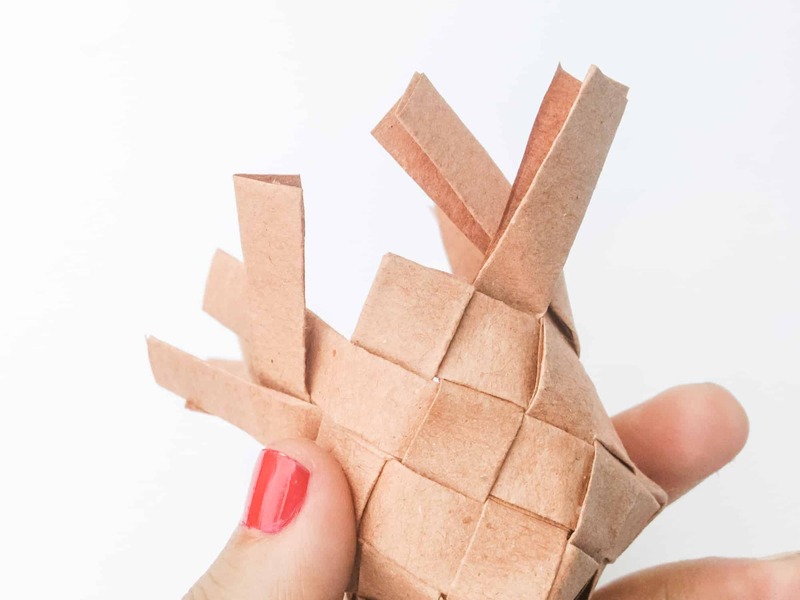 This DIY paper weaving Easter basket craft makes adorable paper baskets that are perfect for decoration or small gifts. 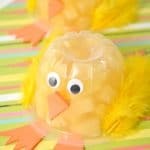 It is a fun Easter craft for kids too! 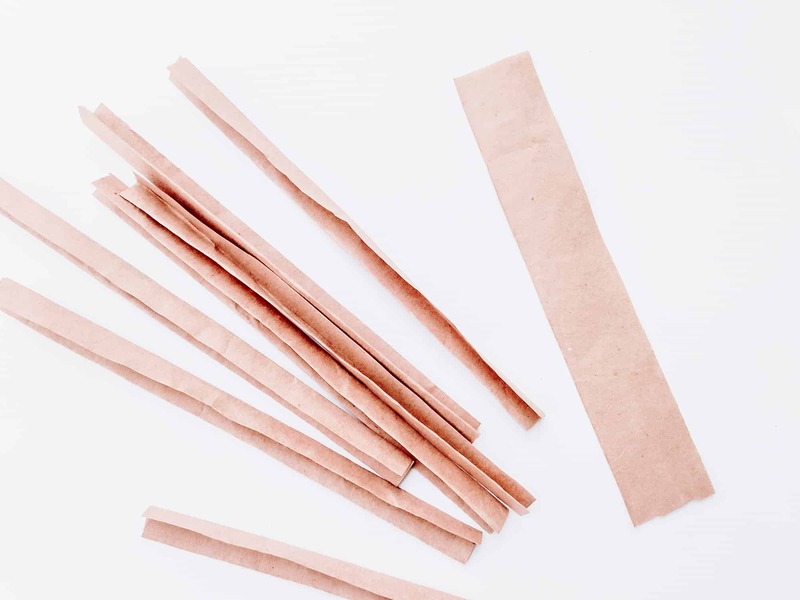 Cut brown paper bag into strips of 3 cm wide and as long as it can be. 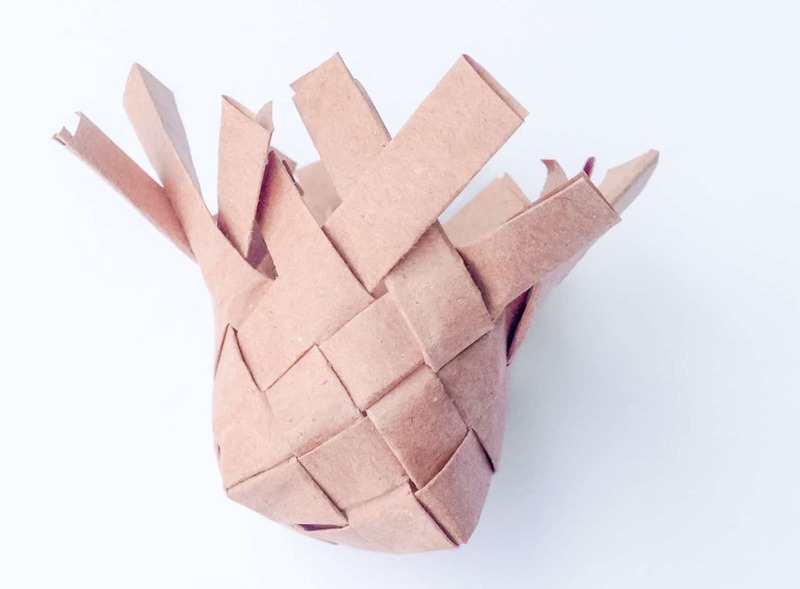 To create mini basket you can use the template pattern. Fold the width of the strips 3 times, thus creating 1 cm wide strips. You'll need an even number of strips to make this basket, we'll be using 8 strips for this project. Layout 4 strips vertically and weave the 5th strip horizontally, over and under the 4 strips. Find out the weave with the shortest height. 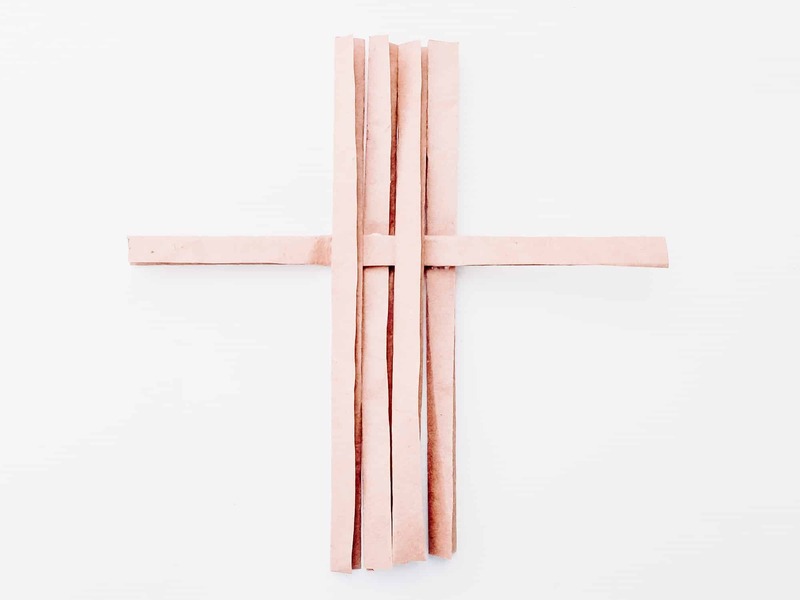 Fold the strip inside if there's any amount remaining after weaving or simply glue the strips together to secure the weaving. Here's an inside view of the closed weave. 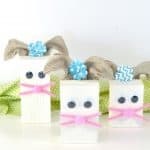 This is a cute Easter project. I showed it to my kids and they asked if they can make it this weekend. Looks like we have an early Easter project. Oh have fun! I hope they love it. This basket is adorable and perfect for Easter treats. It’s so cute. Thanks for sharing at Merry Monday.